Combine the milk and haddock together in a pot and heat over a medium heat until the fish begins flake. Gently remove the fish and peel away the skin on the underside. Mix the butter and flour together to form a paste before stirring into flavored milk, adding a little to the milk at a time and letting it thicken before adding more. Flake the fish into the sauce and taste before seasoning salt and freshly ground black pepper. Cover the dish with cling wrap and set aside. In a separate pot cook off the leeks butter and oil over a medium heat until completely softened. Season with salt and freshly ground black pepper before adding the garlic, carrots and broccoli. Return the fish and sauce to a medium heat with the aromatics added in. Add the mustard powder and parsley and mix through. 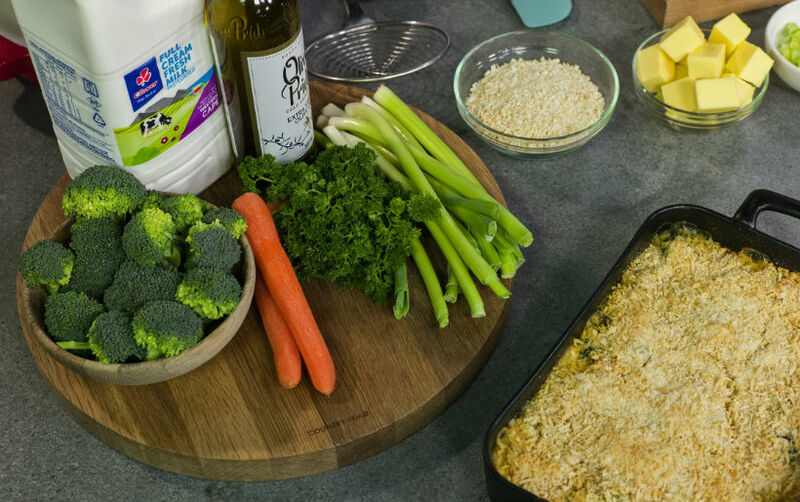 Add the mixture to a roasting dish and top with the breadcrumb topping and bake in the oven for 35 minutes at 180C or until bubbling and the topping is golden brown.